This report from the Mowat Centre and the School of Public Policy & Governance at the University of Toronto, supported by KPMG, is intended to help facilitate informed, strategic, long-term decision-making in healthcare in Canada. This report is part of the Shifting Gears series. The Mowat Centre and the School of Public Policy and Governance have undertaken this study because of our commitment to better understanding how governments can improve their ability to deliver high-quality public services and public policy, even in times of fiscal constraint. This Shifting Gears progress report examines how well governments in Canada and across the OECD are doing in returning to fiscally sustainable positions. It points out that while Canadian governments are in better shape than many of their peers, complacency must be avoided. Many governments have moved forward with short-term and transformative efforts to raise revenue and cut expenses. 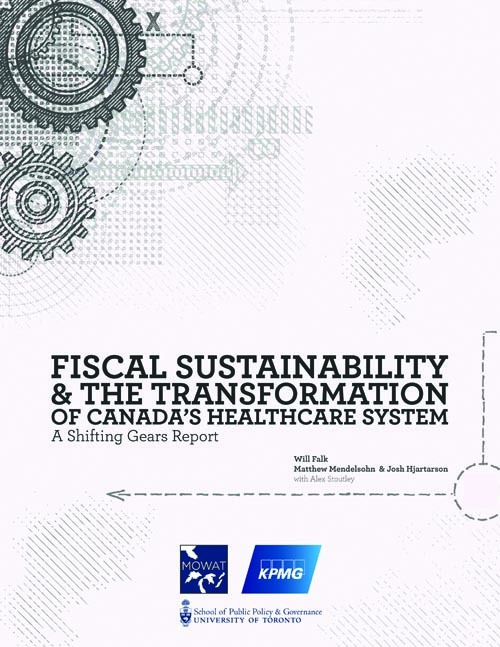 This follow up to our 2010 report, Shifting Gears: Paths to Fiscal Sustainability in Canada, identifies which initiatives are working and which hold the most promise to facilitate a return to balanced budgets, both globally and in Canada. Governments around the world are reducing their footprints and introducing measures to increase revenue. Short-term efforts are usually unsuccessful in putting public finances on fiscally sustainable paths. Even aggressive across-the-board cuts usually fail to change the basic structure of traditional administrative and policy processes. Without change to basic architecture, budgets are prone to rebound. Instead, Canadian governments should begin to fundamentally revisit how they deliver public services. The models they rely on are creaking under the weight of public expectations, entrenched stakeholder interest, and shrinking fiscal capacity. Old business models should be questioned. Supply chain management, back-office consolidation, and procurement are among the day-to-day processes that governments must continue to improve. This ongoing work constitutes business as usual. Governments need to consider how they can do more. Governments must think carefully about incentives, governance, accountability, transparency, and measurement grounded in evidence. These are five lenses through which governments can assess potential reform initiatives. Governments should approach their review exercises by clearly defining objectives and redefining how they deliver public services to meet those objectives from the perspective of the citizen. In order to successfully deliver on a transformative agenda, governments require a clear understanding of what levers they possess to initiate change that will contribute to long-term sustainability. Provincial governments no longer directly control most of their spending on a day-to-day basis. Their costs are driven by salaries and benefits structured through collective agreements, as well as direct transfers to other bodies (colleges, municipalities, school boards, hospitals, among others). These are two of the most important levers that provincial governments possess. But, they have too little control over them to effectively manage for long-term fiscal sustainability. The key levers at the disposal of governments in Canada include: collective agreements, transfers to other bodies, data, hard assets like real estate, and consolidated legislative authority that facilitates the capacity to make changes quickly and coherently. Skills audits to ensure that the least expensive competent practitioner is delivering the necessary service. Collective agreements that include more flexibility for management and labour to respond to rapid changes in technology and job requirements. Client navigation services and program coordination focused on the small number of individuals who are the highest consumers of public services and who often cross back and forth between different service silos. Clarifying governance and accountability relationships with recipients of transfer payments and service delivery partners. Investment in new and better data collection that better facilitates public disclosure and secondary analysis. Consolidation and differentiation in the health and other sectors to generate efficiencies and value for money. Experimentation with payment for performance through the use of Social Impact Bonds and other instruments. Advances in digitization, such as personal accounts so that individuals can manage their interaction with governments. New approaches to collective bargaining and arbitration rules to ensure that governments have an ability to control the costs of labour. Monetization of assets (where appropriate) such as data, real estate, crown corporations, and other holdings. The program landscape in many areas is messy and cluttered. Processes must begin to consolidate programming across ministries and governments, with a focus on clarifying the objectives of programs and measuring whether these goals are being achieved. This should include vertical program reviews, which look across levels of government for savings. It should also include transparent policy audits that clarify program objectives and approaches to results measurement. Governments do not have a good understanding of why so many of their efforts fail to deliver the desired change. Political or bureaucratic resistance is often responsible. The sense of urgency necessary to compel fundamental change is often absent. Our bottom line is that Canadians must summon this sense of urgency. We face significant short-term challenges as well as a long-term structural constraints driven by demographic factors and aging infrastructure. Recent global experience demonstrates that governments have the ability to deploy breakthrough technologies and fundamentally change their delivery models. Recent global experience also demonstrates the consequences of failing to do so. For those who believe in the future of public services, now is not the time for Canadians and their governments to hug the status quo.